This seals it for the Tertis collector. I�d been wondering aloud in reviews when someone would get to grips with his acoustic Vocalions and here they are. This, allied to the complete electrics, also on Biddulph, and John White�s imminent book means that times have never been better for admirers of the pioneering British violist. The Mozart trios, obviously in Tertis�s own viola transcriptions, are notable for Sammons�s singing lyricism and masculine expression and for the well-established balance between the two three. St. Leger is more the classicist anchoring the two romanticists. Portamenti are lavish and pervasive, vibrati well matched, the pungent wit of the finale of K542 � a work they were to return to electrically � charmingly realised.� Their Schubert is songfully lyric, what remains of it that is, even though naturally things such as the slow movement can�t help but feel rushed. The Dvoř�k Bagatelles offer some unusual repertoire for the time; still more so the drastically cut Dunhill trio. This was something Tertis had premiered with Marjorie Hayward and the composer in 1912 so this 1920 recording, whilst naturally representing only a partial view of it, does still show two things � firstly the kind of repertoire Tertis proselytised and secondly the adventurous spirit of Vocalion, when it was in the mood. No other company dared to essay the Quartets of Elgar, Kreisler and Waldo Warner at around this time, all entrusted to the London String Quartet and all duly issued by Vocalion. The second CD gives us a good mix of sonatas, duos and obbligato work. The Handel-Halvorsen prefigures the later Columbia electric that Sammons and Tertis made, the most heroic solo violin-viola record ever made. This one is cut and features some hilarious tempo doubling. Fans of the two string players may recall the incident when they played together at a wartime soiree in front of such illustrious guests as Ivor Novello and Somerset Maugham. As the bombs fell in the distance Sammons and Tertis ignored all expression marks, played all repeats, and at triple forte, until the bombing raid passed. We have outstanding tonal blend between the two in the Fuchs duet, and grand expression in the Handel. The Grieg Sonata was one of many that Tertis transcribed. Here the pianist is Ethel Hobday, wife of the gifted Alfred Hobday, Tertis�s great predecessor as holder of the title of Britain�s leading violist. Ethel Hobday was also Sammons�s mother in law, he having married the formidable Olive. Rugged but expressive and with room for dynamic variance this is an important document of Tertis�s playing. Yes, the registral change in the finale always strikes me as deeply unconvincing, but this is bold, manly, moustache-bristling playing, excellently anchored by Hobday, an elite player. Their Brahms Sonata is no less so and actually preferable to Tertis�s later electric recording with the uneven Harriet Cohen. The massively declamatory finale is perhaps the high point, even more so than the inward cultivation of the sonata�s expressive heart. The second disc ends with what are the most difficult to find of Tertis�s Vocalions, the obbligato sides he made with Zoia Rosovsky. She had a certain cachet at the time though you�d be hard pressed to find anyone now who knows the name. Together they made three sides. Even Biddulph has apparently been sent a dub of Leroux�s Le Nil, so tricky is it to trace. She has a big mezzo tinge and is most convincing in the Duparc. Tertis is well balanced against the voice, thankfully. The booklet features a well-produced picture of a Vocalion record label, a less well produced one of Sammons, a regrettably fuzzy and unreadable reproduction of a full page advertisement from Musical America, and a photograph of a Royal Academy of Music Sight-Singing Prize awarded to Tertis, which I think I saw advertised on eBay not so long ago. There is full discographic information and interesting, if I think in the main somewhat speculative, recording dates. I�m not sure that, in the absence of the recording ledgers (which are lost), one can date them with this degree of accuracy but the dates do seem plausible to me. 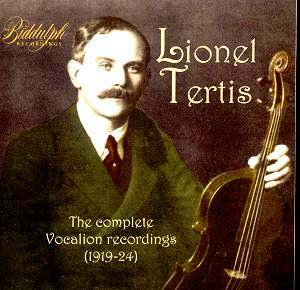 A small discographic point; Tertis always claimed that one of his own favourites among his recordings was Kreisler�s La Chasse. Checking an on-line discography of the violist � I noticed that this was issued in two takes recorded under the same issue number, a common enough practice, but that the sessions were separated by as much as a year, something I�d never been aware of. For those of a collecting bent it�s heard here in the more commonly encountered take, 02112. And so to the transfers. I wasn�t so pleased with David Hermann�s work on the complete Columbias for Biddulph. Here he�s had a trickier job. But I still remain unconvinced. Listening to my 78s � I have all these recordings bar the three Rosovsky sides � I find that whilst the notorious Vocalion scratch has been well attended to the upper frequencies are once again the direct casualty. This compresses the sound. There is audible room ambience in these Vocalions when listened to through sympathetic playback but none comes through on these transfers. There is more ambience and timbral variety in these discs than you will find in these transfers of them. Still, I don�t want to end carping. Less than ideal though they may be, you will still find a huge amount to admire in the performances. And Biddulph�s commitment to restoring all Tertis�s commercial discs to the catalogue has been immense. To them goes the credit. Should they come across other scraps of Tertis�s playing we would be in their debt if they released a supplementary volume. There�s a live broadcast of Walthew�s Mosaics doing the rounds. There may be an as yet unidentified Tertis cylinder � he said he made one. I�d wager it was on Clarion or Sterling but who knows? Then there�s the Bach Double Concerto that he and Sammons recorded in Tertis�s own arrangement for violin and viola; it was never released by Vocalion and the company went on to record d�Aranyi and Fachiri in the authentic version. Until then this set remains a cornerstone collection.